In our latest strategic plan, we've identified eight key trends that will shape the United States and its place in the world in the years to come. We are publishing these trends as part of GAO’s strategic plan for fiscal years 2018-2023 to provide strategic context for our plan. 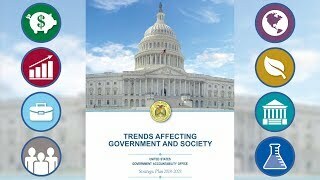 The development of trends for GAO’s strategic plan is a major component of GAO’s foresight activities. By exploring trends, key uncertainties, and their implications, we can better highlight national issues of greatest concern to the Congress and the American people in the years and decades ahead. Taking a longer view also helps us define the strategic context for our work and better address crosscutting and interconnected challenges that will require sustained collaboration and innovation. Key Efforts (GAO-18-395SP) that detail the near-term priorities and substantial bodies of work that will contribute to the accomplishment of our performance goals. For more information, contact James-Christian Blockwood at 202-512-4707 or spel@gao.gov. GAO-16-533T: Published: Mar 21, 2016. Publicly Released: Mar 21, 2016.